We keep an eye out for monarch caterpillars on the milkweed near our home. This year for the first time I see many fuzzy caterpillars on the plants. They have some similar colors to the monarchs, but are very furry. What might they be? Should I worry about them competing for food? We live near St. Paul, MN. 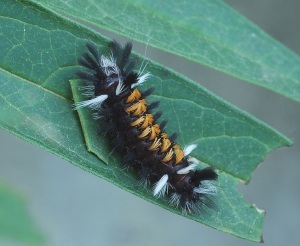 If the picture above is what your caterpillars look like, then you have Milkweed Tussock Moth caterpillars. If you want to get rid of them you could take a pail of soapy water (water and dish soap), hold it under the caterpillars and knock them into the water. Then you won't have to worry about them competing for the milkweed. The moth lays clusters of eggs underneath the milkweed leaves. Hope this helps. Have never had these before until this year. There are so many...e are not seeing Monarchs. Hey there! I live in Hastings, Mn,and I have also found three of these little creations. they are quite a sight! Every time i try to hold it, it is like a steam engine on my arm! lol. This caterpillar is harmless. No need to kill them. Just move them to another milkweed plant. This is the only plant they eat. I have dedicated my 200 milkweed plants in my garden to the monarch but these also show up.